Myself, I’m not so sure that Linden’s right about that. I wonder if Mr. Lipshitz might’ve had more of a shot than he suspects. Linden became a star onstage in the ’60s and then a household name in the ’70s, at a time when show business seemed more open to performers with unusual looks, weird names, and urban attitudes. Linden is classically handsome, with a profile that looks like it was carved out of marble, but from the bushy mustache he wore while playing Barney Miller to his willingness to look rumpled, he fit right into the era of Peter Falk, Al Pacino, and Woody Allen. He was very much the lumpy New Yorker. When I spoke to Linden, he had recently returned to his home in Palm Springs after being away for a while, and the house seemed to be falling apart all around him during our conversation. He had to change phones twice because of a series of weird technical glitches, and at one point his smoke alarm started beeping loudly. Linden soldiered on, but I kept picturing him as NYPD 12th Precinct Captain Barney Miller, trying to maintain an aura of dignity and an air of command in an office with no air conditioning, a busted toilet, and the smell of stale coffee wafting from the hotplate in the corner. Linden was at first reluctant to take what would turn out to be his signature role. “I didn’t want to leave New York,” he said. He’d recently won a Tony for playing the lead in the musical The Rothschilds, and was fielding offers left and right. (“I was hot that year.”) But his agent convinced him that it wouldn’t hurt to fly out to Los Angeles and shoot the pilot for what was then called The Life And Times Of Captain Barney Miller. The pilot didn’t get picked up, but it drew some attention when ABC burned it off as part of their summertime Just For Laughs series in 1974, so the network ordered 13 episodes to run as a midseason replacement in 1975. The show went on to run for seven more full seasons, performing solidly and even producing a spinoff: the Abe Vigoda-starring Fish (the first season of which is included in Shout! Factory’s Barney Miller box). Barney Miller sits squarely on my list of favorite TV series of all time, and there are days when I’d say it’s my favorite among favorites. (That’s why I made sure to include it in the first round of my “A Very Special Episode” columns.) 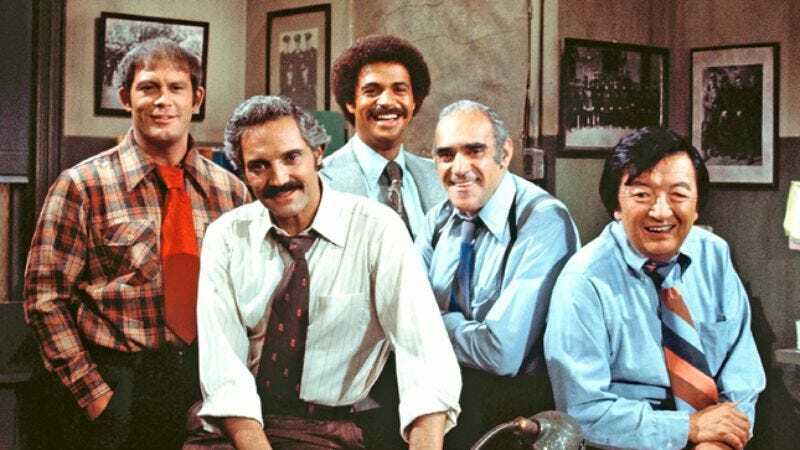 When my colleagues recently asked in the “Reasonable Discussions” podcast what would be the sitcom equivalent to The Wire, Barney Miller was the first show that occurred to me, even though I knew that’s more literal an answer than the question demands. Still: Barney Miller is a lot like The Wire, in that it’s about the drudgery of law and order, not the thrills. One of the selling points of doing a sitcom for Linden was that he assumed it would be like live theater, shooting in front of a studio audience. And that’s the way that Barney Miller started out. But Danny Arnold was a notorious perfectionist, and would be re-writing scripts right up until the cameras were switched on. After a few too many nights where restless audiences had to wait an hour or more past the scheduled start, Barney Miller became one of the rare shot-on-videotape ’70s sitcoms that was performed on a closed set, sometimes going until the wee hours of the morning as Arnold tweaked scenes one line at a time. He’s right about that. But it says something about the era in which Barney Miller was made that a crumbling, leaky, smelly portrait of New York City could be considered relatively upbeat. It was a time when cracks were expected—even encouraged. A time when a Lipshitz could be a leading man.